As the demands for fitness professionals grow, more people will be entering this field. There remains no single, standard qualification or certification required to practice as a personal fitness trainer. The Medical Fitness Network wants to distinguish the health and fitness professionals who have a higher level of knowledge, skill, and expertise. Anyone with basic knowledge of the fitness industry can advertise themselves as a fitness trainer. This does an injustice to the many experienced and credentialed health and fitness professionals. This also puts the consumer at risk and places an unfair burden on them to screen and research the credentials of a potential health and fitness professional. Most in the general public do not know how to develop the components of a progressive fitness program. People with chronic medical conditions have an even greater challenge. They need to find a fitness professional that has specialty training to understand their specific needs and limitations. We want to help the community by providing a network of qualified health and fitness professionals. We list each professional’s training and education allowing you to search for the specific skills and knowledge you need in a medical fitness professional. What is a Medical Fitness Professional? Medical fitness professionals help make the transition from medical management and/or physical therapy to a regular physical activity program following a surgery, an injury, a medical diagnosis or exacerbation of a pre-existing condition. 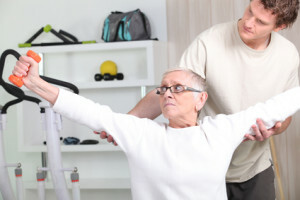 They possess the training and skills to work with medical conditions; medical needs may include obesity, diabetes, hypertension, neuromuscular disorders, heart disease, lung disease, osteoporosis, orthopedic injury, cancer, Alzheimer’s, arthritis, Parkinson’s, multiple sclerosis, and mental disorders. Medical Fitness Professionals should help you improve your fitness levels and decrease your risk factors for disease. They can help you regain your strength, endurance, and functional movement during and following rehabilitation for diseases, disorders, surgeries and ailments. They can work in complement with your health care team. They have the knowledge and skills for designing, implementing, and modifying exercise programs for you. They understand the roles of various healthcare professionals and will work with them to enhance your exercise program. We want to educate the consumer about what to look for when selecting a medical fitness professional and what to expect from them. They should holds a bachelor’s or master’s degree in a fitness or health related field and/or a national recognized certification. They should have taken specialty certifications or continuing education courses in the areas of “special medical concerns”. They should participate in continuing education to stay apprised in safety, methodology and technology in the fitness industry. They should have professional liability insurance. They should have current CPR/AED certification. They should conduct an initial fitness assessment collecting information about your lifestyle, exercise & health history and help you set safe and realistic fitness goals. They should provide you with a medical, orthopedic or physical therapy release form if appropriate and adjust as needed. They should evaluate your needs, fitness level, and capabilities when designing a progressive fitness program for you. They should have knowledge about the various symptoms of your disease and levels of ability. They should be able to explain their methods and reasoning behind every aspect of your fitness program. They should help you prevent risk of injury by supervising your exercises and assigning appropriate weights for you. They should assist in proper form, range of motion, and be able to explain what muscles you are working. They should design a fitness program that includes various components such as aerobic, strength, balance and flexibility. They should inform you about the importance of a warm-up preceding your supervised training with them. They should explain the importance of monitoring your heart rate while exercising. They should have pre-planned workouts for you, keep detailed records and track your progress. They should recognize when exercise should be stopped due to health risk or concerns. They should be able to recognize concerning signs that might indicate a need for return to your medical treatment team for further evaluation prior to return to exercise. All in all, the fitness professional should help educate you about how your body functions and how to exercise in a safe, effective manner to achieve the results you want, monitor your progress and provide supervision and support throughout.